Lavished (f. by Half Hennessy). 2 wins at 2, A$126,388, STC De Bortoli Wines 2YO H., AJC Shellharbour 2YO H., 3d Canberra Guineas. Sankara Spirit (g. by Oratorio). 4 wins at 1200m, 1400m, A$154,175, 2d ATC Schweppes H., Hyland Race Colours H., Ipswich TC Labour Day H., Entire Group H., 3d ATC Testa Rossa at Vinery H., TAB Place Multi Sprint H., BRC Cardno H., Butler McDermott Lawyers H.
Star View (f. by Universal Prince). 2 wins at 1100m, 1200m, 2d STC Graeme Boyd's Suzuki of Newcastle H.
Cool Prince (Victory Prince). 8 wins to 1300m, A$121,510, VRC Greenline Welter H., VATC St Razzle H., 2d Mornington RC Hareeba S., L, VATC Soultine H., 3d SAJC Blackwell Funerals Prospect H.
Zodiac Star (Victory Prince). 6 wins-2 at 2-to 1200m, A$189,285, AJC St George Leagues Club 2YO H., Westminster H., Oneworld Circle Pacific H., STC Victor Sports P., 2d AJC Balmoral 2YO H., Baiada Poultry H., BTC Main Roads H., STC Winfreux Quality H., Korea Racing Association Trophy H., Parramatta Leagues Club H., 3d STC Satellite S., L, Civic H., L, MRC Lombard the Paper People Welter P., AJC Aureole Welter H., STC Truscott's Toyota Welter H., Avondale H., 4th VRC Bob Hoysted H., L.
Broad Blaze. 5 wins-1 at 2-from 950m to 2000m, 2d STC Bardwell Park H., 3d AJC Mirvac Hotels Show Stopper H., STC Forest H., Rosie Sun H.
Star Signs. 4 wins at 1000m, 1100m in Aust. Scorpio Spirit. Winner. See above. Eleanstar. Winner at 1000m in Aust. Spanky. 2 wins at 1000m, 1500m in Aust. Producer. Gold Reserves. 3 wins at 1000m, 1200m in Aust. Henry Gilbert. 9 wins from 1000m to 1900m, QTC Faux Tiara H.
Cajun Steel. 8 wins from 1000m to 1600m, A$118,680, QTC Harry Plant H., STC Tooheys New H., 2d QTC Avitt H., 3d QTC Ormiston College H., AJC Padstow H., STC Ranvet H., Newcastle JC Country Cup, SCTC Summerveld Racing Stables H.
High Spire. 3 wins at 1000m in Aust. Vodka n Ice. 3 wins at 1200m, 1400m in Malaysia. Sauveterre. 2 wins at 1200m, 1400m in Aust. Sarabia. 2 wins at 900m, 1000m in Aust. SCORPIO (Kaoru Star). 6 wins. See above. Garter Star. 12 wins from 1200m to 1650m, QTC Deception Bay Welter H., BATC Manikato Graduation S., Novice H., 4th Qld Tatt's RC XXXX Mile H., L.
Stilyiard. 7 wins from 1200m to 2000m, STC Jim Pike Welter H., Redcraze Welter H., Emu Plains H., Merrylands H., Anniversary H.
PUBLIC SERVICE (Nearchus). 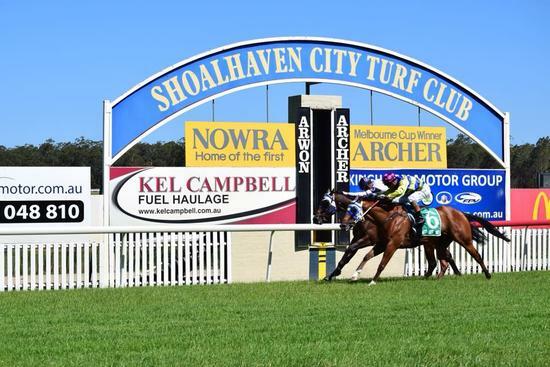 10 wins from 1200m to 2400m, AJC Colin Stephen H., L, May H., STC Denistone H., AJC Havilah Novice H., STC Padstow Encourage H., Erskineville H., 2d NSW Tatt's RC Tattersall's Club Cup, L.
Official (Selhurst). 2 wins at 1300m, 1600m, AJC Flying Fox H., STC Engadine H., 3d NSW Tatt's RC Tattersall's Club Cup, L.
Amarta. 6 wins. See above.